Throughout the past year, we have been consistently inspired by stories of our partners doing good in their local communities and around the world. We have seen how businesses really can make a difference, but it is the commitment and the goodwill of the individuals supporting these causes that make us proud to know and work with each and every one of you. Today, as Microsoft Inspire comes to a close, we are happy to share one more story of partner philanthropy. We first learned about the work being done at the Discovery Center through Microsoft Philanthropies. Here is what inspired Microsoft partner BlumShapiro to be the change they wanted to see in the world. The Discovery Center is a non-profit organization in Hartford Connecticut that empowers schools, youth, families and community members to understand and eventually challenge systemic racism and other forms of oppression. 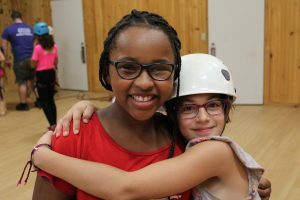 Their flagship residential camp program for students is an imaginative learning environment in the foothills of Woodstock CT where “a classroom without walls, for a future without prejudice” is a motto and central value. A passion for justice and pragmatic optimism drives their mission to envision and build an equitable and just world where everyone has what they need to grow and thrive. They work toward that vision every day by providing professional development for educators, diversity & inclusion leadership workshops for students, and community conversations about race and difference for parents and engaged community members. While the Discovery Center was focused on empowering their students, they struggled with their technology. They were challenged by the task of connecting a remote workforce to each other and the resources that were so critical to their success. Despite having an on-site server, everyone was saving their files to their desktop. Remote workers struggled with staying in touch with the team. They had a hard time keeping track of the material they were developing, and they knew they were especially concerned with maintaining digital security as they were tasked with managing a large amount of student information. – Kate Busch Gervais, Executive Director of The Discovery Center, Inc. Through a grant program, BlumShapiro Consulting was able to use the Microsoft Office 365 suite of products to help the Discovery Center get better connected and accomplish their technology goals. They knew that for this unique breed of workforce, communication, collaboration, and document sharing is key. BlumShapiro recognized their challenges and recommended migrating their on-premises systems to the cloud with Office365. Enabling more of the Office 365 platform beyond email services eliminated the need for an on-prem server and VPN, both of which would have been expensive. Office 365 also empowered the team by giving them access to cloud computing. SharePoint and the OneDrive helped centralize information and resources for employees, provided a user-friendly way to store and save docs that could be accessed anytime, anywhere. Additionally, Microsoft Teams and Skype for Business provided an easy-to-use collaboration hub, instant messaging, and video conferencing system that keeps everyone connected and in constant contact. By working together, BlumShapiro and the Discovery Center were able to light up a new set of digital solutions that could make teachers and staff more efficient and successful on the job. But the journey hasn’t ended yet. They are working to connect the Discovery Center with Dynamics 365 to help the organization track programs and pursue opportunities further than they ever have before. From financial transactions to diversity statistics, the management of their program data in a one-stop Microsoft 365 way will help enable the team at the Discovery Center to bring their vision of a more inclusive learning environment to life. For more information about the Discovery Center, check out their YouTube channel. What stories have you heard about Microsoft partners doing good? Share your experiences and stories here in the Microsoft Partner Community.